I have very distinctly made it to Acadian territory traveling through eastern Quebec and New Brunswick. 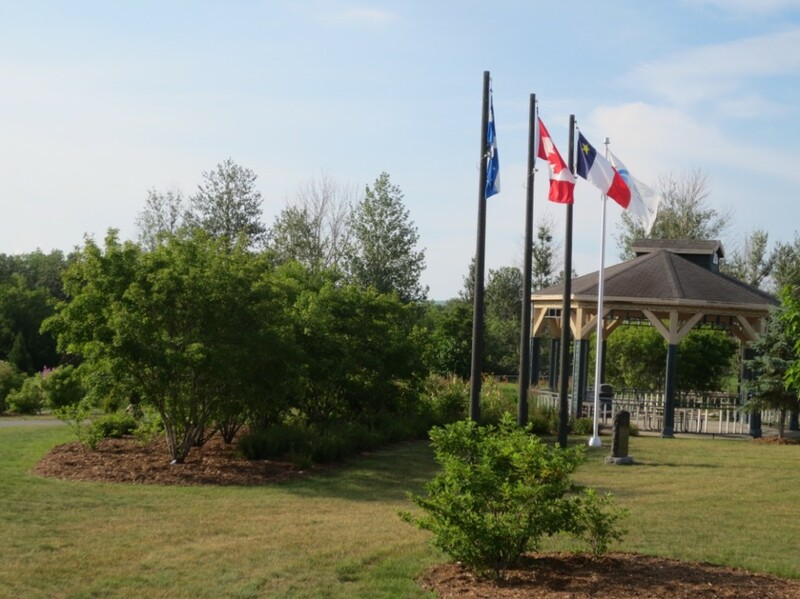 And at an auspicious time too as this region, communities in both Maine and New Brunswick, is about to host the quinquennial Acadian World Congress. Unfortunately, the actual festivities will be later in the summer. The French tricolors with a gold star in the blue field is everywhere and on everything. Someone even painted three moose antlers and hung them from a tree! 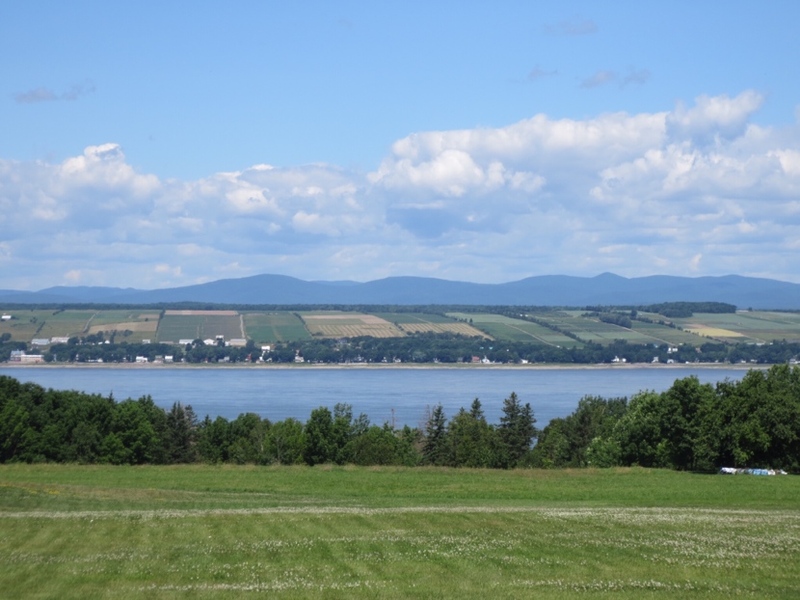 I was vaguely aware of Acadian history didn’t realize how strongly Acadians identified with their heritage or just how prevalent these communities remain in the Maritimes (and New England, Louisiana, and Texas). The last few days I’ve been traveling much further north than east just to get around the top of Maine. Once overtop, I’ll almost be backtracking. Had I come from the southern tip of Ontario, it would have been a serious trip north. It has gotten me thinking about borders. It seems to me the border between Canada and the US reflects both the relationship between local communities and their relationship to the land. Not every stop is the same. Certain points become important guiding posts for orienting what is finished or yet to come. Just as Sudbury marked the point at which the end of northern Ontario became real, Quebec City marks the start of the final leg in this journey. I feel myself finishing now, not just a fantasy or a simple fact but it’s becoming a reality in my mind. I will need to temper my growing anticipation of completion or I’ll be too preoccupied to fully experience the wonders of the Maritimes still ahead of me. 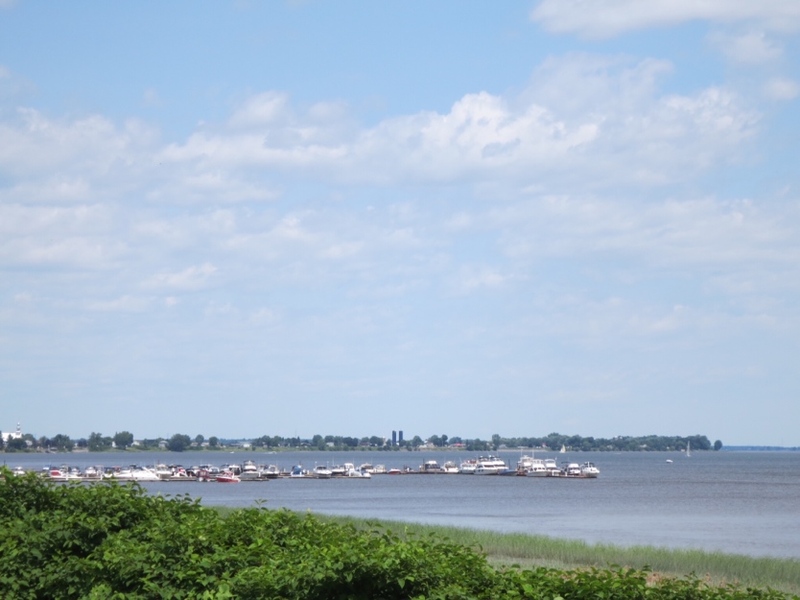 Today for instance I had planned to loop around the Ile d’Orleans in the middle of the St Lawrence and end the day where I started but I needed to move along. Most French Canadians trace their ancestry through that island and it’s suppose to be a step back into 19th century francophone society but I couldn’t do it. Only a hundred and thirty eight years ago to the day, my great great great grandfather Peter Quiring arrived in Quebec City on the SS Moravian from the Mennonite colonies in Russia to start a new life with his young family. He and his wife Helena probably had little time for sight-seeing or reflection as they still had a significant portion of the journey to the prairies before them. Mennonites had started to settled in southern Manitoba a few years earlier in 1874 so they must have heard some reports of the difficult trek ahead as well as the long hard winters. 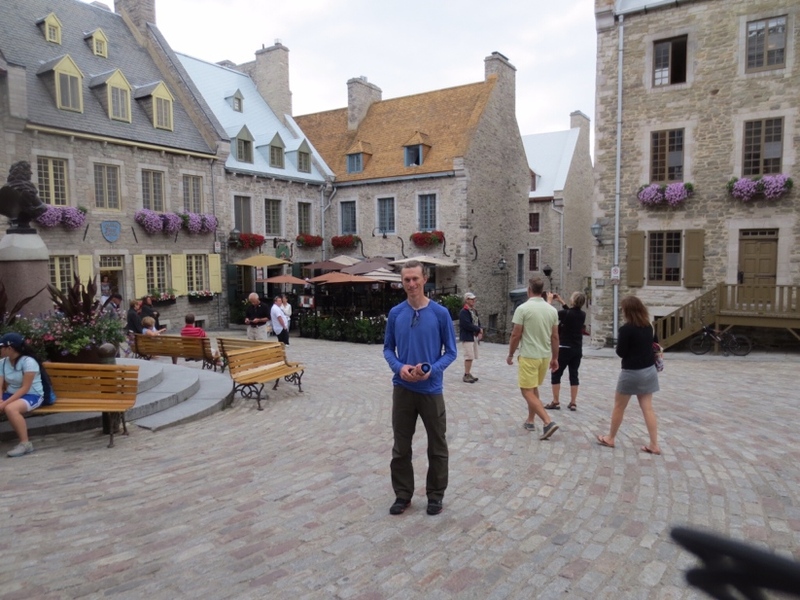 Quebec likely wasn’t as clean, quiet, or colorful as it is today. In the mingling of animals, people, and markets, the city must have smelled as strongly as the bustling noise of business on the narrow streets. Clanging over it all, the church bells may have reminded them that their journey from the comforts of home were in the hopes of preserving their faith. As they saw, the increasing pressure to become Russian citizens could only come at the cost of their beliefs. Moreover, the scarcity of land was creating two classes in the colonies between the landowners and the rest. Of course, the sounds, sights, and smells of the vibrant religiosity of the city’s Catholicism would not so much have been welcoming as a reminder that challenges to their faith as they saw it were as present in the “new” world as the the “old”. The religious history in Quebec is intriguing and omnipresent. Like the English Puritans who settled New England, many who came to New France intended to establish paradise on earth. As with other colonists in the Americas, the goal was premised on racist notions about the innocence of the people they encountered and the “new world” as a blank slate uncorrupted by European decadence. Not surprisingly, the financially lucrative fur trade quickly revealed the jagged edges of human nature and then the French lost their colonies to the English. As the story goes, the English knew better than to attempt at transforming their new French citizens into loyal English subjects of the King so they reached a compromise with the Catholic Church. In exchange for accepting Bristish dominion, the Church would administrate her French communities without interference. And so began the indirect and absolute power of the Church over the history, culture, and politics of Quebec. 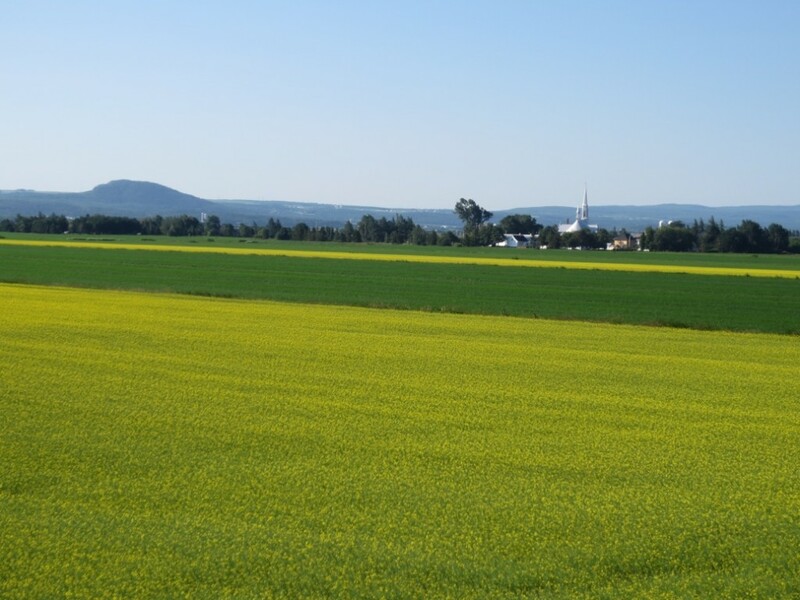 Look up at any given moment cycling through Quebec and you will likely see a number of silos and steeples dotting the horizon. The dome-shaped cylinders and silver spires tower over the villages, green fields, and trees. This is the kind of place that intrigues me to no end. Sometimes I have to pinch myself to make sure I’m really here in this place. Today I’ll touch on the silos, which signal dairy farming and as you know tickles my fancy. I could simply gush all over the page about the wonderful cycling day I had today and so I’ll do just that. 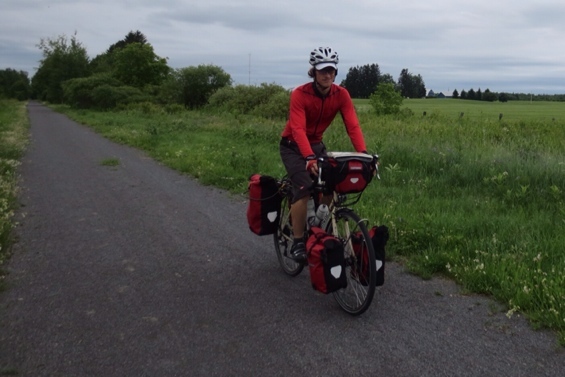 Cycling the Chemin de l’Anse beside the Ottawa River was like traveling along an old village lane. It was narrow with no shoulder, little traffic, and a speed limit below 50km/hr. I particularly enjoyed the signs telling people to take the highway if they were in a hurry. At times the road was canopied by trees with openings revealing the river below and at other times it ran past fields. And the most delightful homes of various architectural styles popped up all along the road. While a number were clearly new homes and beautiful, it was the old heritage homes that caught my eye. They ranged from large estates to small cottages and all full of character. Beside the river, I was clearly traveling through a region that moneyed people had been moving to for awhile. But there were enough homes that regular folks could probably afford that it didn’t feel like a gated community. Often have I looked covetously at the straight lines and gentle grades of the rail lines and dreamed about cycling along them instead of the winding, hilly roads. Today my yearning was answered. I spent the majority of the day on the Prescott-Russell trail, which takes you from Ottawa to the Quebec border. With finely crushed gravel, it’s a little slower than pavement but without a car in sight, worth every bit of the extra energy required. 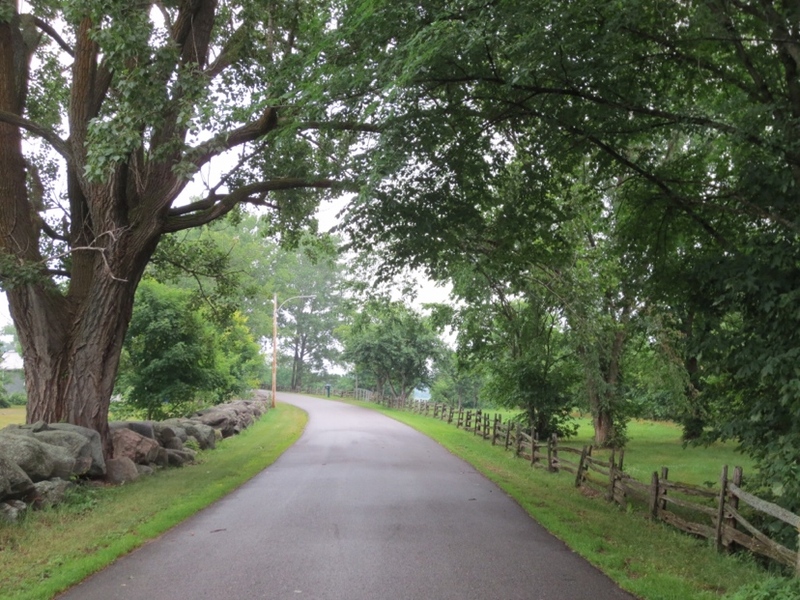 Cycling behind farmers’ fields and through forests took me back to cycling the Erie Canal a few years ago. It’s a little like exploring places through the back door or alley as the towns and villages are not oriented towards your path. 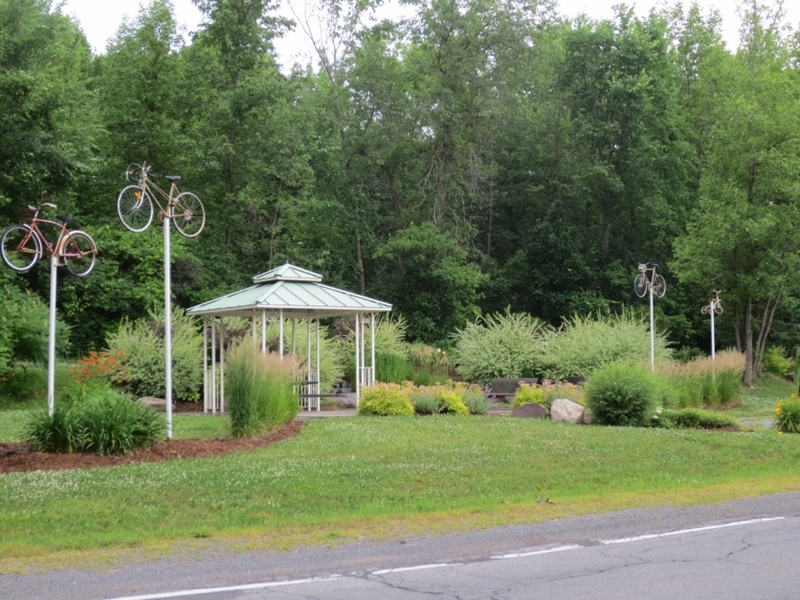 The difference between the canal and the rail trail is that there are still little villages located along the canal which was not the case today. With the advent of the automobile, passenger travel by train died and slowly the villages dedicated to rail disappeared or developed towards the highway. For example, I passed a natural springs resort that at one time had three hotels and attending infrastructure. Today only open fields remained and a marker of a different time. All to say, I actually found the rail trail kind of lonesome, haunted by people and place no more. Cycling past some lush wheat fields along the Prescott-Russel Trail. During the winter it’s a snowmobile trail, which there are a lot of in this area. As with the capital of any nation, Ottawa offers a lot to see and explore all laden with various historic and national significance. 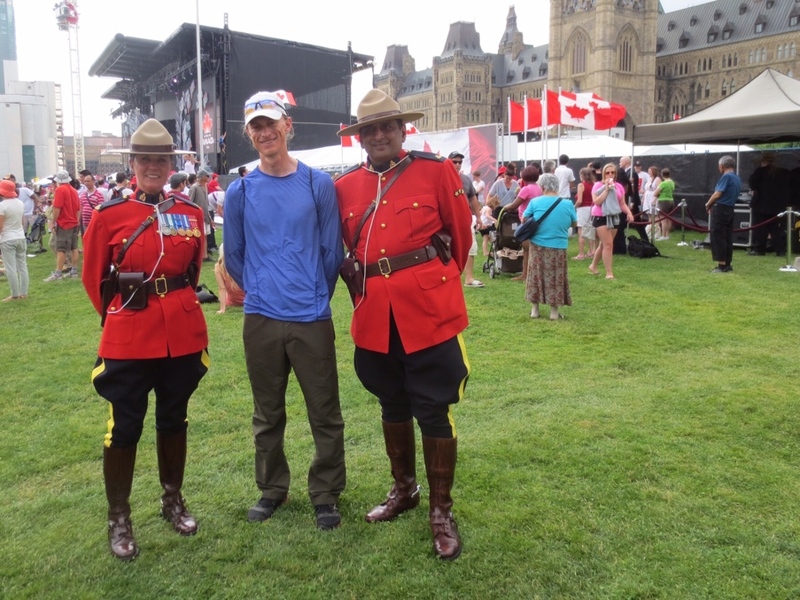 I took in a few festivities and the fireworks on Canada Day and a day on either side exploring the city. I confess to spending little time in the various museums and galleries and instead took in the architecture, monuments, and places including some of the lovely bicycle paths. I managed to tour both the centre block of the Parliament including the Peace Tower and Rideau Hall but unfortunately missed the Mounties’ musical ride at the stables by a day. Much remains to be be seen and explored for another visit, maybe during the winter when the Rideau Canal is frozen over and one long skating rink.